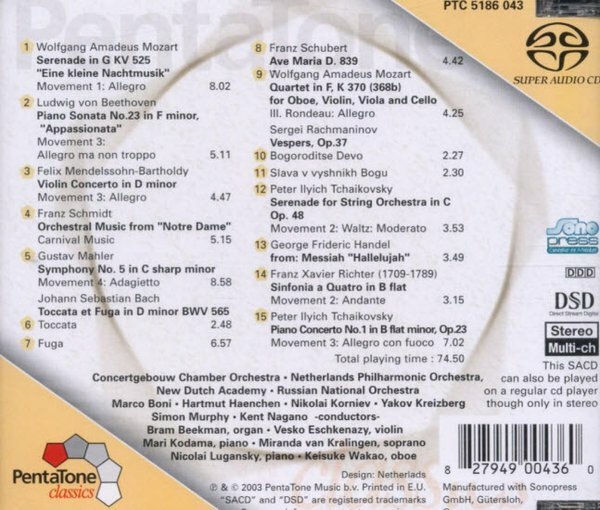 These CDs serve their purpose well offering complete movements or sections of recordings available on Pentatone. The only listing of contents is on the back jewel-box cover; the booklet(s) are actually catalogs of what is available in the format. Each CD is given a full page in the booklet with complete track listings and performer information. I'm surprised each of the CD booklet doesn't list all of the multi-channel recordings (both new and RQR) on the label. One features excerpts from new multi-channel recordings; the most impressive sonically are those by the Concertgebouw Chamber Orchestra, New Dutch Academy, Russian National Orchestra and the Netherlands Philharmonic Orchestra Dvorak/Tchaikovsky coupling. All of these are 5 channel recordings (left/right, front and rear, and center front). 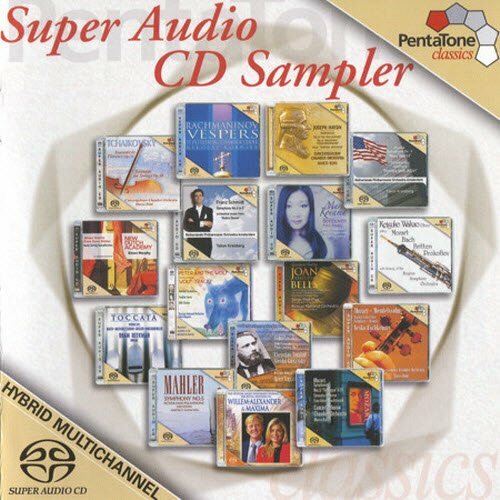 The other CD samples RQR (remastered quadro recordings) made in the '70s; these have been discussed at length on this site and all of them have been reviewed. All are the original four-channel master analog recordings (the SACD player still reads 5 channels but there are only four), and most are superb—for more information read the reviews. I would question Pentatone's choice of repertory. From Tchaikovsky's Symphony No. 6 they have included the second movement—why not the exciting third movement with its display of full-orchestra sound? And from Beethoven's Piano Concerto No. 4 we have the quiet second movement instead of the rousing finale. I also question their decision to release these samplers at full price. They are samplers and presumably will result in collectors buying many of the complete recordings.